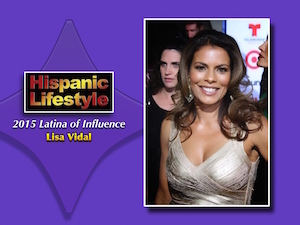 Actress Lisa Vidal is a 2015 Latina of Influence named by Hispanic Lifestyle. Lisa is being recognized for being an advocate for actors, actresses while championing the support of diversity themed entertainment projects. Hispanic Lifestyle’s 2015 Latinas of Influence will be recognizing Lisa and her fellow Latinas of Influence during a luncheon held in their honor on at Latina Conference 2015. Award winning actress Lisa Vidal, is no new comer to the challenging multi-layered roles she’s been so successfully portraying. She is most recognized for the regular roles she’s played on popular hit primetime series such as Boston Legal, CSI Miami, The Division, ER, Third Watch and Southland. Vidal can currently be seen starring opposite Gabrielle Union on the hit BET series “Being Mary Jane,” which just began it’s second season. A strikingly beautiful seasoned actress of Puerto Rican descent, New York City native Lisa Vidal began acting in Repertory Theater at age 14 and was cast the following year in the PBS series “Oye Willie” jump-starting a long and varied acting career, most often playing grounded professionals balancing work and family. Vidal then reoccurred “New York Undercover” (Fox), playing the sister of Michael DeLorenzo’s NYC police detective which widened her audience growth. Vidal was soon cast as cocky Jessica Helgado in the critically-lauded police drama “High Incident”, a Steven Spielberg production aired on ABC and on the sitcom “The Brian Benben Show” (CBS). Vidal’s exceptionally powerful performances and ability to portray both hard and soft in turn without either side being shorted with two-dimensional treatment continues to make her one to watch. NextLatina of Influence | Irene Zoppi-Rodriguez, Ph.D.